View of the Indian PSLV-C16 rocket from the top of Mobile Service Tower. Achieving a booming success after two rocket failures last year, India deployed three satellites in orbit early Wednesday (April 20) with the Polar Satellite Launch Vehicle, a workhorse 14-story booster that racked up its 17th straight successful mission. The rocket blasted off at 0442 GMT (12:42 a.m. EDT) Wednesday from the Satish Dhawan Space Center on Sriharikota Island on India's east coast, where it was 10:12 a.m. local time. Producing a combined thrust of 1.9 million pounds, the launcher's six strap-on boosters and solid-fueled first stage powered the PSLV to an altitude of more than 40 miles in less than two minutes, then a hydrazine-fueled second stage took over to accelerate the rocket to nearly 9,000 mph. Two more stages finished the job, placing the rocket and its three payloads in a stable orbit. "I'm extremely happy to announce that the PSLV-C16/Resourcesat 2 mission is successful," said said K. Radhakrishnan, chairman of the Indian Space Research Organization. The announcement was met by boisterous applause from engineers inside the PSLV control center. Although the PSLV has a successful track record, the Indian space program suffered through a troubling year with consecutive launch failures of its larger GSLV rocket and accusations of institutional nepotism. The PSLV's three satellite payloads stacked before the rocket's nose shroud was installed. The PSLV's fourth stage released the 2,658-pound Resourcesat 2 spacecraft 18 minutes after liftoff. Replacing an earlier satellite launched in 2003, Resourcesat 2 will help officials respond to natural disasters, monitor agriculture and manage urban and rural roads and infrastructure. "This is the 18th launch of the PSLV, and Resourcesat 2 is the 18th remote sensing satellite of India," Radhakrishnan said in post-launch remarks. Resourcesat 2 will aid environmental scientists in measuring soil contamination, tracking water resources and monitoring land use trends. India's national security agencies will also use Resourcesat 2 data. The spacecraft carries three visible and infrared cameras with a peak resolution of 5.8 meters, or 19 feet. The imagers are upgraded versions of the cameras flying on Resourcesat 1, an aging predecessor satellite that has already outlived its lifetime projections. Designed to operate for at least five years, Resourcesat 2 also features advanced and miniaturized electronics and carries an experimental ship-tracking Automatic Identification System instrument to collect position, speed and other information from seagoing vessels. The AIS payload was built by Com Dev of Canada. YouthSat, a joint mission between Indian and Russian students, carries three science instruments to study the upper atmosphere and measure solar cosmic rays. X-SAT, Singapore's first national satellite, has a multi-spectral camera and will demonstrate space-based remote sensing and image processing technologies. YouthSat and X-SAT each weighed about 200 pounds at launch. 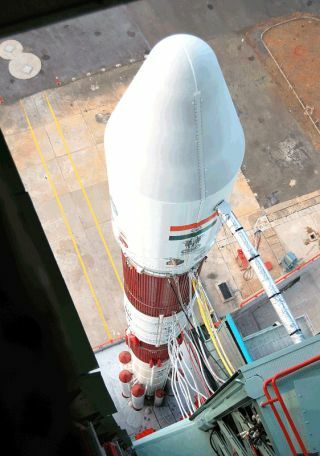 The PSLV flight was the first space launch of 2011 for India. Three more PSLV missions are planned this year, with the next scheduled for June with India's GSAT 12 communications satellite. Officials are still investigating and fixing problems that doomed two GSLV launches last year. India is also trying to perfect a homemade cryogenic third engine for the GSLV. The domestic powerplant was the culprit in a GSLV launch mishap in April 2010. Turning to a pair of Russian cryogenic engines left in its inventory, ISRO launched another GSLV flight in December, but the rocket disintegrated less than a minute after liftoff when the vehicle lost control. The PSLV flew once in 2010, but that success was overshadowed by the biting failures of the GSLV and the scrapping of a corrupt deal between the Indian space agency and a multimedia communications firm. A controversial S-band bandwidth contract between Antrix Corp., ISRO's commercial sales division, and Devas Multimedia was annulled in February by a government cabinet committee amid allegations of corruption. Devas is headed by a former senior ISRO official, and the company paid $300 million to lease S-band communications capacity on two satellites due to be launched in the coming years. Citing rising strategic and societal needs, the Indian government terminated the deal in February.